Well Behaved Women: I passed the 71,000 word mark and I am smack in the middle of the mayhem-filled climax. Not sure how much I might get to work on it this week, but fingers crossed. I’d love to be able to put it to bed and get going on book two. The Adventures of Strongarm & Lightfoot – Blades of Glory: Cover art finished, waiting on final manuscript edits. 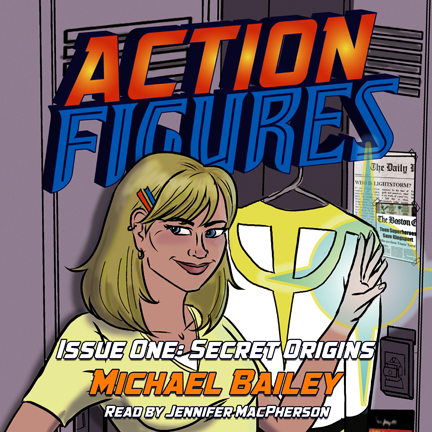 Action Figures – Issue One: Secret Origins (audiobook): The review work is done! The vast majority of my notes were on technical issues such as wonky edits, mismatching audio quality, the occasion skip, etc., but my narrator Jennifer MacPherson did a great job of juggling all the voices and putting some solid emotion into the dialog. Once all the fixes are in I’ll have to listen to the whole thing again — it’s 10-plus hours of material — but hopefully there will be no more issues to address and I can get this out to readers (listeners?) next month!